Germany has adopted a policy where it will be easy for Non-EU citizens to move to the country as skilled workers. Additionally, they can get a job too. In an attempt to attract more, immigrants, the government announced an agreement regarding the Immigration to Germany issue. This will help the skilled workers (Visa) of non-EU areas to search for a job and do a job in Germany. The chances of asylum seekers remaining in Germany after they were rejected, but also found a job work and successfully integrated into society. As per the new immigration law, skilled foreign labor having an adequate training/education will face less restriction when they try to get a job in Germany. 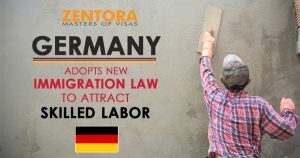 All non-EU citizens will get the permission to work in Germany if they possess Proper Vocational Training, A Valid Degree Course, Or an Employment Contract. Furthermore, German companies in every sector can now recruit foreign skilled workers. In the past, they had permission to recruit workers only in specific sectors. Additionally, job seekers now have six months period to find a job in Germany but undergoing the vocational training is a requirement. Moreover, the law gives the asylum seekers, remaining in the country, an opportunity to get a better residency permit, after facing the rejection. Now they are in a position to secure a permanent job. Horst Seehofer, the Interior Minister of Germany said that coalition partners agreed to have clarity in rules through the legislation. This will meet the needs of the German business community to employ skilled workers. Moreover, it will facilitate orderly and controlled immigration. The legislation will also help to reduce illegal migration significantly. Steffen Kampeter, The Chief Executive, Confederation of German Employers’ Associations, assessing the agreement said that it is important for maintaining the economic competitiveness of Germany. Furthermore, it needs qualified overseas workers. The opposition in the parliament said that the agreement was creating more bureaucracy and dense regulations for migrants. It was not helpful in easing and simplifying their condition. Please contact us for any additional information regarding the new amendments. © 2018 Zentora All rights reserved.